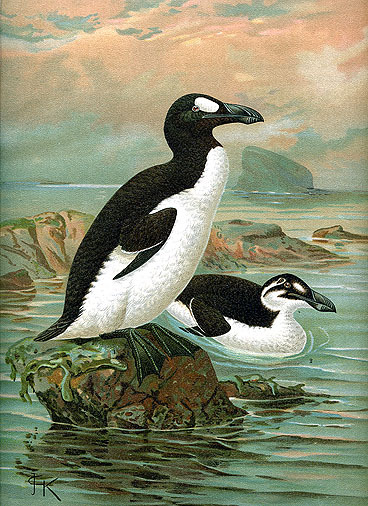 The Great Auk was a large and flightless bird that became extinct in the mid-19th century. It was formerly of the genus Alca, and the only modern species in the genus Pinguinus, which is a group of birds that are from the Atlantic Ocean region. When this species was alive, the bred on rocky and isolated islands where there was easy access to plentiful food supply as well as to the ocean. When they are not breeding, they spent their time foraging the North Atlantic waters from as far as Greenland, Norway, and Iceland to as far south as northern Spain. 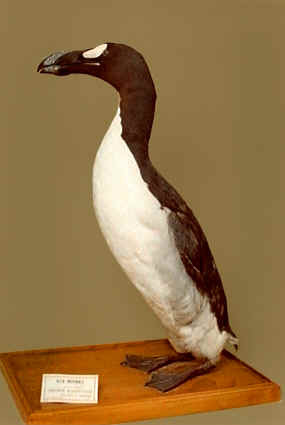 The Great Auk has an average height of 75 to 85 cm tall, and weight about 5 kg. This makes it the largest member of the alcid family. It has a black back and a white belly. Its black beak was hooked and heavy, and had grooves etched into the surface. When the Great Auks were breeding, they had a white patch over each eye. However, after this they lost their patch and developed a white band that stretched between its eyes. Its wings are quite long, at 15 cm. This renders the bird flightless. However, its strong locomotive suit was swimming. It was a powerful swimming and hunter in the water. Great Auk pairs were loyal to each other and mated for life. This was despite the fact they lived in extremely dense, social colonies. They laid a single egg on bare rock. This egg was white with brown streaking. Both parents incubated the egg for approximately 6 weeks before their young hatched. When the young auks left their nesting site for about 2 to 3 weeks, their parents still continued to care for them. Great Auks preyed on fish such as capelin and menhaden, as well as crustaceans. Funnily enough, although they were excellent swimmers, they were rather clumsy on land. 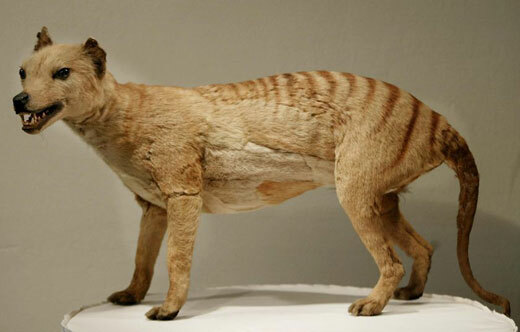 Its main predators were white-tailed eagles, orcas, humans, and polar bears. Humans have hunted the Great Auk for more than 100,000 years. Many Native American groups place this bird as an important part of their culture as it was both a symbolic item as well as a food source. The Maritime Archaic people were buried with the bones of the Great Auk, and one was buried with a cloak created from over 200 auk skins. The early European explorers to the Americas also used the Great Auk as fishing bait or as a food source. As a result, this reduced its numbers. The bird’s down was also high in demand in Europe, which almost eliminated the entire European population of this bird during the mid-16th century. Soon, Scientists began to realise that the Great Auk was disappearing so many environmental laws were passed to protect it. However, this was not enough as its rarity increased interest from private collectors and European museums who obtained the eggs and skins of this bird. This trend sadly eliminated the last Great Auk on 3 July 1844 at Eldey, Iceland. However, in 1852, there was a record of a bird that is thought to be the last sighting of this species. In honour of this great bird, the scientific journal of the American Orinthologists’ Union is called The Auk.